Olde England Lakes is a popular, affordable neighborhood for the family needing convenience and family activity. It is convenient to downtown Kennesaw or Acworth, churches, shopping, schools and activities for your whole family to enjoy. Olde England Lakes is a neighborhood traditional homes priced between $252,000 and $442,000 with covenants to protect your property values. Olde England Lakes is in a very sought-after area. Olde England Lakes has many amenities from which to accommodate an active family. The amenities include a swimming pool, tennis courts, playground and a community clubhouse. The school zoning for Olde England Lakes are Frey Elementary, Durham Middle and Allatoona High School, and Cobb County has a reputation for great schools! 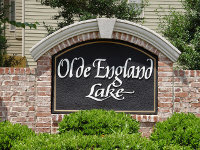 Olde England Lakes has a Homeowners Association that oversees the management of the neighborhood. Covenants protect your privacy and property values, which helps to keep the neighborhood clean and retain your investment value. Olde England Lakes is located in Kennesaw: Take US 41 North to Acworth Due West, turn left then right on Stilesboro Rd. and the neighborhood will be found on the right.